The official trailer for Walt Disney Pictures' live-action version of The Jungle Book has been released, and it's a wild one! 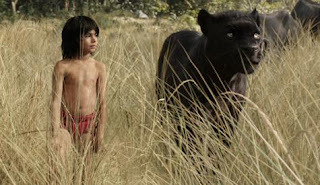 The movie stars Neel Sethi as Mowgli and features the voice talents of Emjay Anthony as Grey Brother, Idris Elba as Shere Khan (*faints*), Giancarlo Esposito as Akela, Ralph Ineson as Father Wolf, Scarlett Johansson as Kaa, Ben Kingsley as Bagheera, Bill Murray as Baloo, Lupita Nyong'o as Raksha and Christopher Walken as King Louie. This is NOT the cute and cuddly version we're used to. This movie is full of action and suspense and I definitely want to see it! The Jungle Book is set to be released in spring 2016! Check out the official trailer below! What do you think of the teaser trailer for The Jungle Book?